Are you an attorney that uses Macs, or would you like to be one? Ether way, you’re in luck. MILOfest is a legal technology conference for Mac-using lawyers, and it offers practical and substantive tips on Macs, iPhones, and iPads. It will be held this year from November 12-14, 2015 at the Disney’s Yacht Club Resort in Orlando, FL. Join Victor Medina, Mark Metzger, and me on Monday at 1:00pm (eastern) for this free Executive Teleseminar to learn more about MILOfest 2015. Click here to register or get more information. If you’re in the market for buying a Mac, whether to make the switch from PCs or to upgrade an existing one, you may be wondering which Mac should you buy? 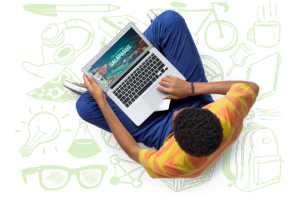 Fear not, as Macworld recently published an article to help you choose the right Mac for you. This guide provides an overview of all the models currently available, what each model is best suited for, and a full in-depth review of each for those who want to know more. Those looking for a one stop shop with everything you need to help decide which Mac you should buy should definitely check out this guide. Source: “Which Mac should you buy?” by Roman Loyola, published at Macworld.com. 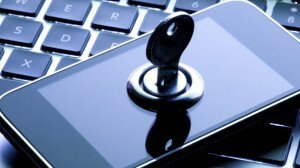 This Thursday, June 18th at 1:00 p.m. Eastern, my friend and colleague Tom Lambotte, CEO of GlobalMac IT, is presenting an invitation-only, executive webinar, during which he will share some alarming news about new cybersecurity threats that you should protect your firm against – and the best ways to protect yourself and your practice. Chances are that you are not aware of these new threats and therefore may be a “sitting duck” and at risk of losing everything in your bank account in an instant – not to mention the potential added insult to injury of government fines and penalties for non-compliance to data breach laws. Although Tom has limited attendance to only 50 people, I have made arrangements to reserve a block for my readers and followers readers to get a VIP seat. You can get the full details (and register) for “7 Critical IT Security Protections EVERY Law Firm Must Have In Place NOW To Avoid Cyber-Attacks, Data Breach Lawsuits, Bank Fraud and Compliance Penalties” here. Are you a lawyer? Do you tweet? Do you like lawyers who do? If so, you’re in luck, because Tim Baran compiled a list of “50 forward-thinking lawyers” on Twitter that he recommended people follow to keep abreast of “what’s shaping the legal profession.” So who are these lawyers on Twitter? Tim’s list included such legal illuminati as Kevin O’Keefe (@kevinokeefe), Lee Rosen (@LeeRosen), Ernie Svenson (@ernieattorney), Tom Mighell (@TomMighell), Matt Homann (@matthomann), Catherine Reach (@catherinereach), Rodney Dowell (@rodneydowell), Dennis Kennedy (@denniskennedy), Stephanie Kimbro (@StephKimbro), Nicole Black (@nikiblack), and Jim Calloway (@jimcalloway) – all of whom I’m proud to call friends. Tim was also kind enough to include @TheMacLawyer on this list, and I certainly appreciate it. 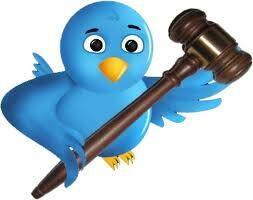 Source: “50 Lawyers You Should Be Following on Twitter” by Tim Baran, published at Legal Productivity. Because our firm understands the importance of technology, particularly for South Carolina family law attorneys, so our firm’s other attorneys, Jenny Stevens and Jonathan Lounsberry, will also be attending this conference. 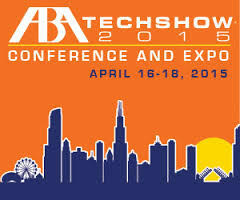 If you are in Chicago or at TECHSHOW, please stop us and say hello. 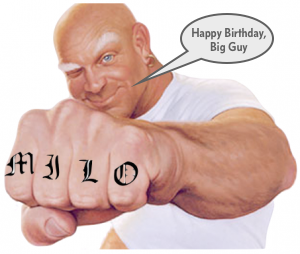 Though I’m a few days late, I want to publicly wish a very happy birthday to one of my babies, the Macs In Law Offices (MILO) forum. This “little idea that could” arose from a conversation Grant Griffiths and I had about our frustration with another then-prominent forum, and it was founded on February 17, 2007. Over the last eight years, Macs in Law Offices (MILO) has become (by far) the largest legal technology forum for Mac-using attorneys. Today, its membership exceeds 4,500, and it is the premier source for lawyers who want to maximize the use of Macs in their law practices. MILO’s membership roster reads like a virtual who’s who of legal technology, from attorneys to software developers, small firms to big firms, and everyone in between. I would like to extend a very special thanks to the following individuals who have each been instrumental in their own way to making MILO what it is today: Grant Griffiths, Randy Juip, Finis Price (RIP, my friend), Victor Medina, and Randy Singer. If you are not yet a member, you can take advantage of this free resource by clicking HERE. Let’s face it – webpages are sometimes so cluttered with banners, ads, etc. that they are just difficult to read. 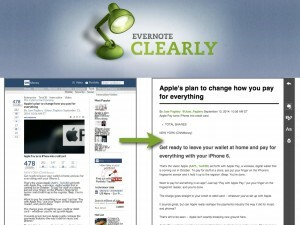 That’s where Clearly from Evernote comes in. This browser plug-in makes blog posts, articles, and webpages clean and easy to read by clearing away everything but the content. 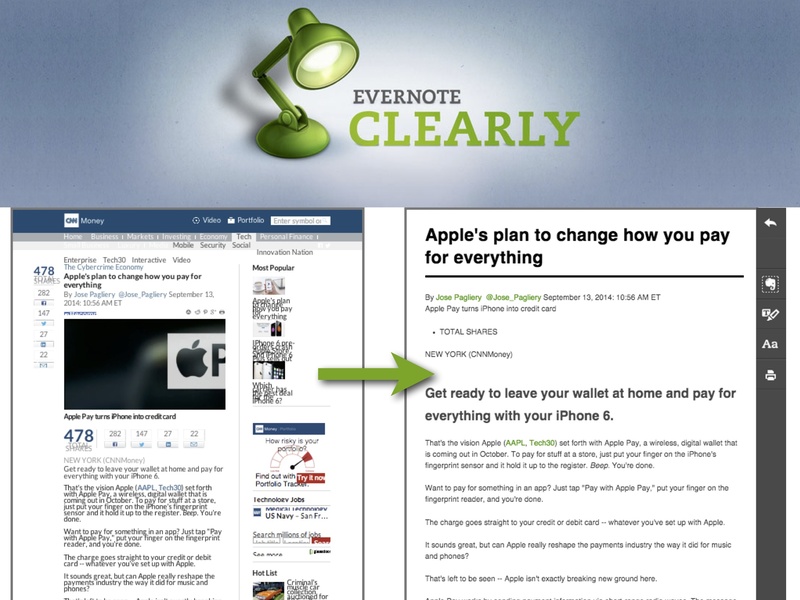 Clearly also provides the ability for you to highlight portions of the text, print the “clean” version, or save it to Evernote with one click for easy access later (whether you’re online or off). Do you enjoy wasting time on hold while listening to elevator music? Me neither. 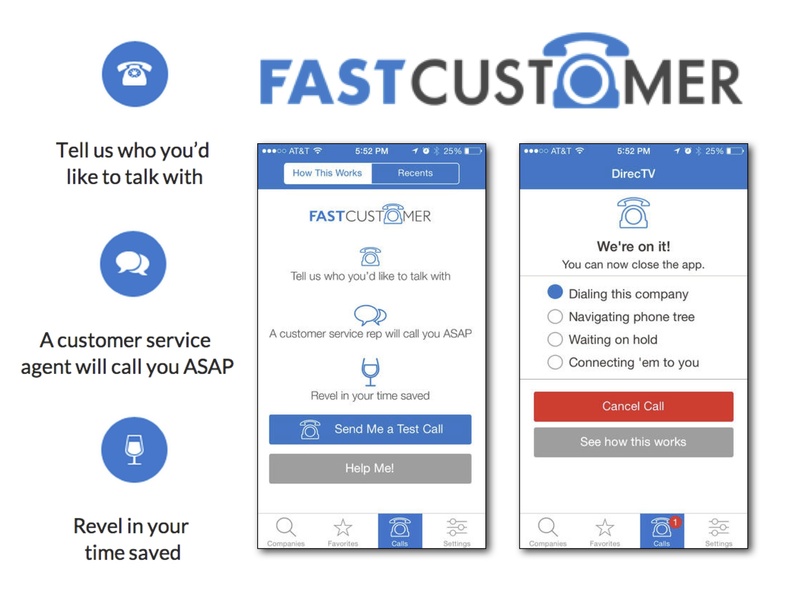 FastCustomer can (thankfully) make that experience a distant memory. Simply let them know the name of the company that you would like to talk with (via call, text, or search), and they will have a customer service agent from that company call you. Voila! No time wasted and no elevator music. 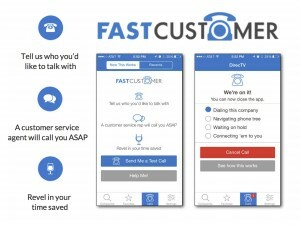 FastCustomer is available via website or its iOS and Android apps. Among the thousands of companies that participate in this service are Apple, Verizon, AT&T, Bank of America, Southwest, Citibank, Mastercard, Visa, Discover, Sirius/XM, USPS, Walmart, Costco, etc. AppShopper – Notifies you which apps (both iOS and Mac) are on sale each day and allows you to create wish lists containing the ones that you are most interested in. AppSaga – Lists apps that are available for no cost, which includes Apps Gone Free (apps that are temporarily available for 100% off). iOSnoops – Features lists of price drops, apps that are free for a short time, new apps, etc. 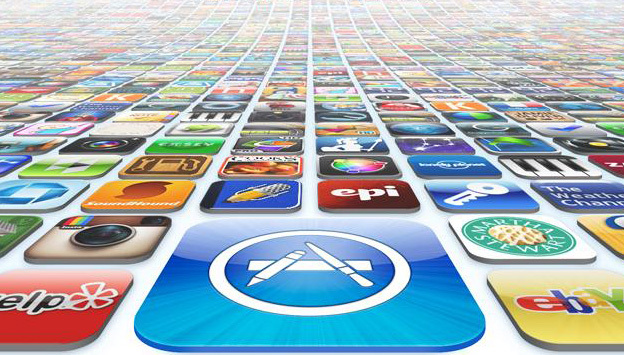 App Store – Apple’s old reliable offers one free app per week. 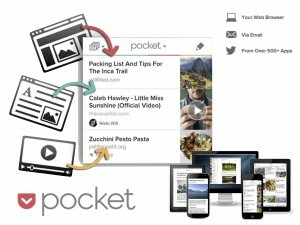 Pocket (formerly Read It Later) enables you to save things that you find online to review later. The most common use is to save articles, videos, recipes, and other items of interest to read when it’s convenient for you, even if you don’t have internet access (like when you’re on an airplane). You can send items to Pocket through plug-ins for most web browsers, numerous apps, or even via email. Follow the lead of the over 12 million users who have saved over 1 billion items to Pocket.